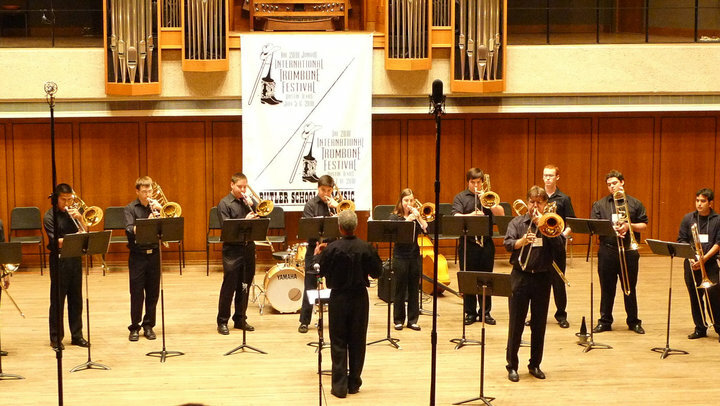 This year I was solo artist for the 7th time at a International Trombone Festival. This year held in Austin-Texas in the USA. It was very, very hot in Austin but the Airco system made a great festival possible. This years festival was hosted by Nathaniel O. Brickens. 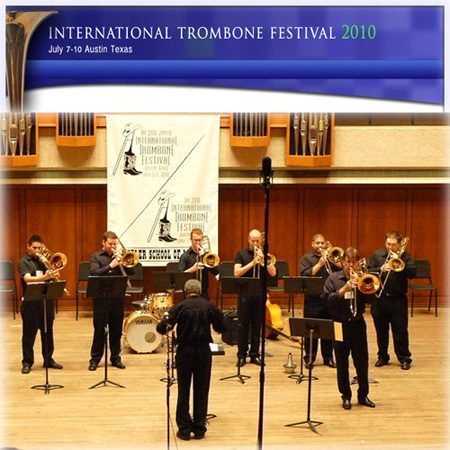 Past President, International Trombone Association Professor of Trombone, UT Austin. The university had some real nice venues to organise this festival in. The festival was very well organised by Jon Bohls with his wonderful team including his lovely wife Sally! 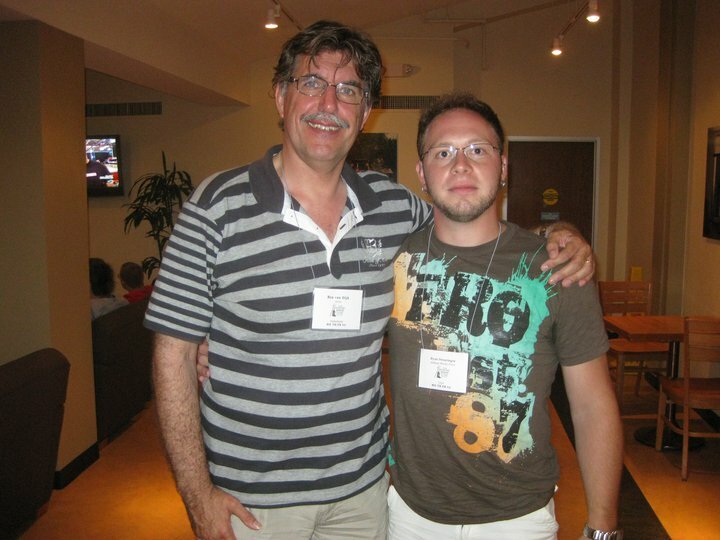 The ITF starts to become a sort of reunion for me after attending the festival for so many years. It was nice to see my former students Noel Wallace and Jeremy Stones again. Jeremy won the Kleinhammer Orchestral audition competition this year! Others I saw again were Jan and Vern Kagarice, Newel Sheridan, Billy Robinson, Steve Wolfinbarger, Bones Apart, Viento Sur, Ian Bousfield, Jaques Mauger, Jimmy Markey, Niels-Ole Bo Johansen, Jessica Buzbee, Michael Davis and many more. It was also nice to meet new faces like Dave Brubeck. Great guy and wonderful player! After hearing a great recital by Jim Markey (New York Phil ) I was a bit worried about my own performance. I did not have a great night although the nerves were in control. Because of many excuses I was not super prepared for this years festival but all went very well. I decided to simply do my own thing and not think to much of the way Jim played. We are different players for sure and that makes festivals like this interesting. I was well supported by Nat Brickens and his trombone ensemble. 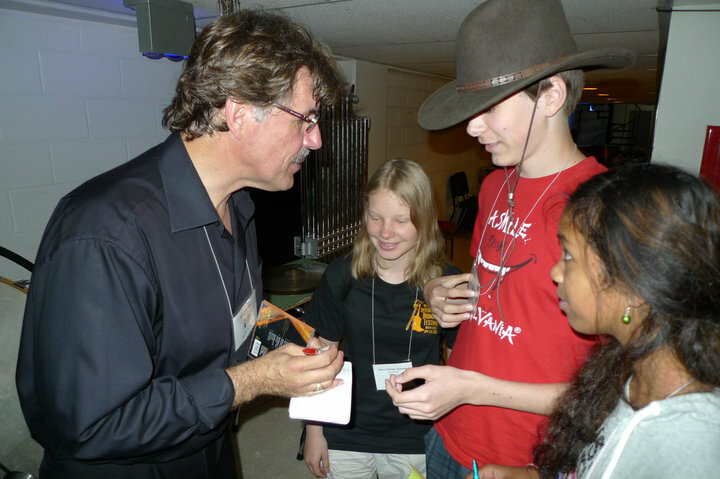 I also gave a clinic in which I showed my ideas of a RELAXED-VOCAL approach to playing the bass trombone! It was great to see my friend Michael Massong for the first time at the ITF as soloist. He was not so happy with his performance. It is a big podium but I think halfway his recital he showed his real potential in Wotans Abschied by Wagner and in the Ballade by Martin. Great job and congratulations Michael! Good to hear you will be back at the next festival! 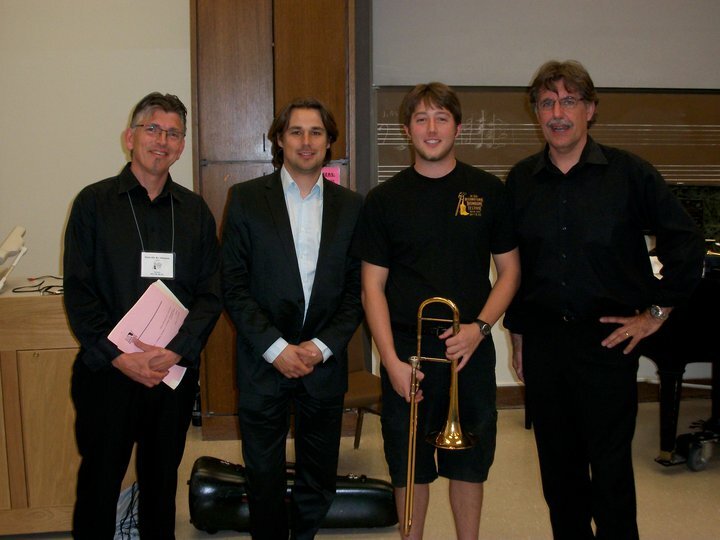 Max Thein was there during the festival with some of our great Thein trombones. Many players were very interested in both tenor- and bass trombones. I also like to thank Max for his super support during the festival. A real friend! Ryan Swearingen, a bass trombone student of Jan Kagarice who has plans to come to study with my at the Codarts Conservatory in Rotterdam. Looking forward to this. A very nice and eager boy! After the duet "Make my garden grow" by Bernstein which I played with Jorgen van Reijen, conducted by Nils Ole BO Johansen and trombone ensemble. The young man in the middle is Dillon Swift. Jorgen's performances were. like always, a treat. 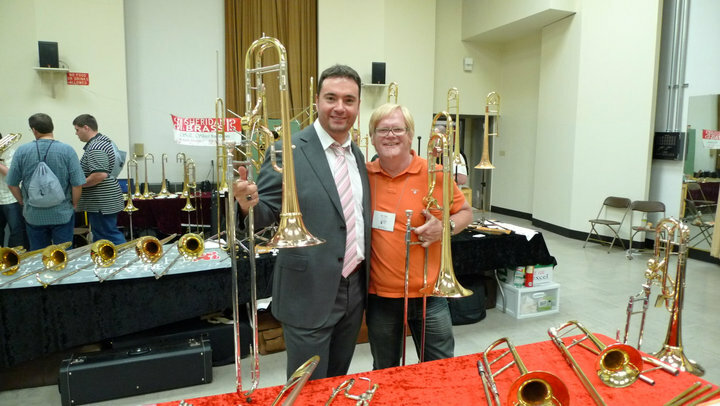 What a great tenor trombonist he is and it is nice to work together with Jorgen so regulary! Together with the lovely Jessica Buzbee and Max Thein. Jessica played an awesome recital! Besides winning the Yaxley and having great people with me the entire time, this made my trip! Thanks guys! Other great performances I attended were Viento Sur with original music form Argentina for trombone quartet. Amazing! Bones Apart with music from their latest cd's. Jim Markey, Jorgen van Reijen, Ian Bousfield, Michael Massong and probably many more but I was to bussy with rehearsing and more so I could not see all concerts. 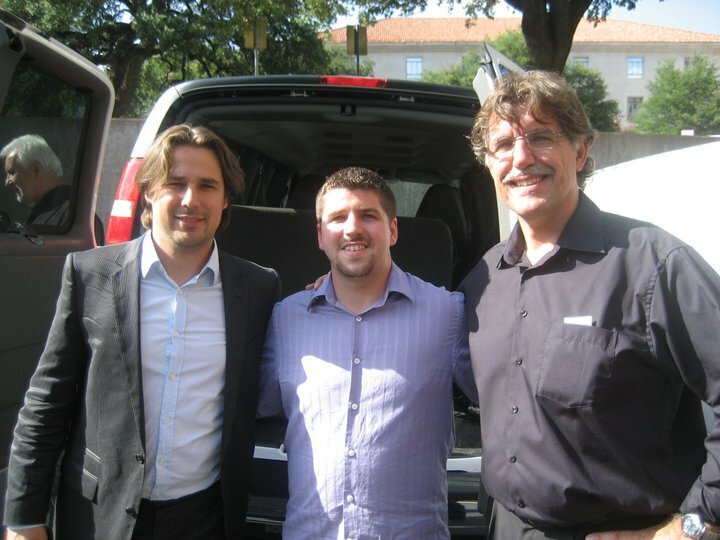 I had a great time in Austin and like to thank Jon Bohls and Nat Brickens for inviting me!